This savory cheese pie is made with puff pastry and filled with four different types of cheese and a black tea and cinnamon infused béchamel sauce. 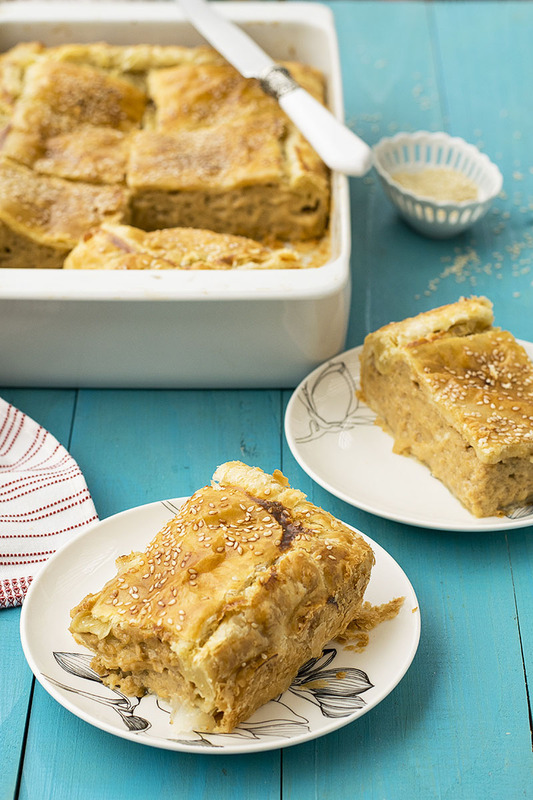 This savory cheese pie is not your average Greek cheese pie. 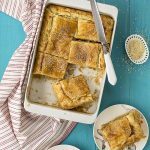 You see, I wanted to post a cheese pie recipe for a long time now, but I was wondering if it would serve any purpose since the internet is already filled with many great recipes for Greek cheese pies. Well, this is a totally different and out of the ordinary savory cheese pie with four different types of cheese and a creamy, warm and comforting black tea and cinnamon infused béchamel sauce. 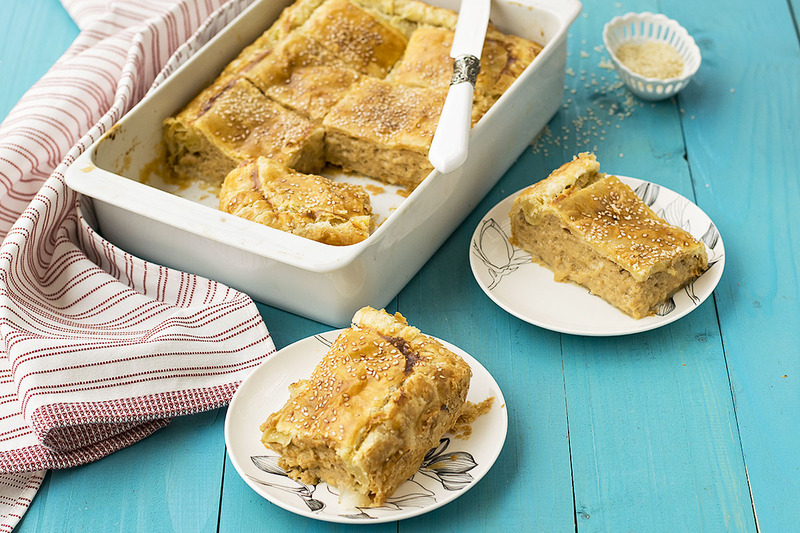 There are lots of pies in Greece, both savory and sweet. 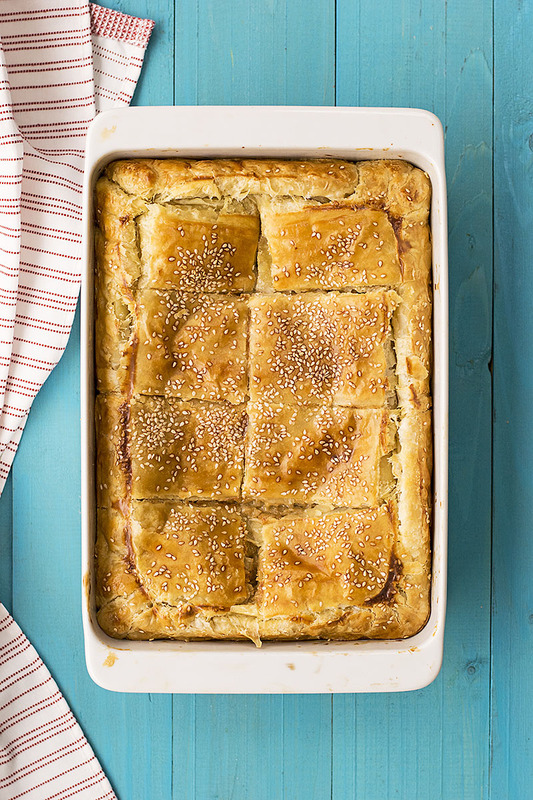 Greek savory pies are filled with anything you can imagine, from minced meat, to cheese or greens with herbs (like the famous spinach pie). Sweet pies can vary from myzithropites which are myzithra hand pies (myzithra is a type of fresh cheese similar to ricotta) to pies filled with fruits (like this amazing apple crumble pie) or creams and custards like this incredibly easy and delicious Greek milk pie with phyllo (Bougatsa). In general, savory cheese pies are divided into two big categories. Those made only with feta and those with a mixture of cheeses. I can’t say that I favor the one over the other, because when made right, both types are pretty good! The crust can also differ depending on the household. In some cases it’s homemade, but it can also be store-bought puff pastry or phyllo, especially if time or convenience is of the essence. Here, I use puff pastry because there’s just something really magical in the way the creamy filling and the flaky crust combine. You can choose your favorite types of yellow cheeses to use in this recipe, but try not to omit the feta because it provides the necessary tanginess which brings balance to the filling. 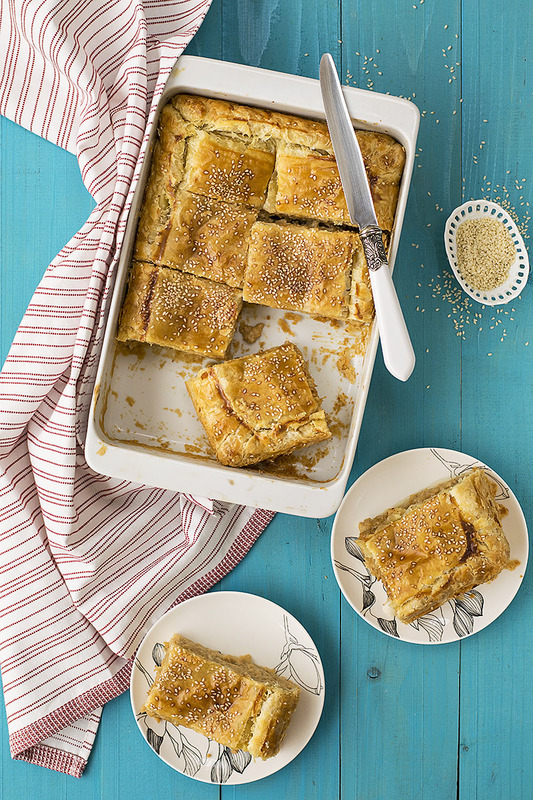 This pie works well with puff pastry, homemade pie crust, or phyllo. Omitting the step where you infuse the milk for the béchamel sauce with the black tea and the cinnamon will give you a more traditional cheese pie. 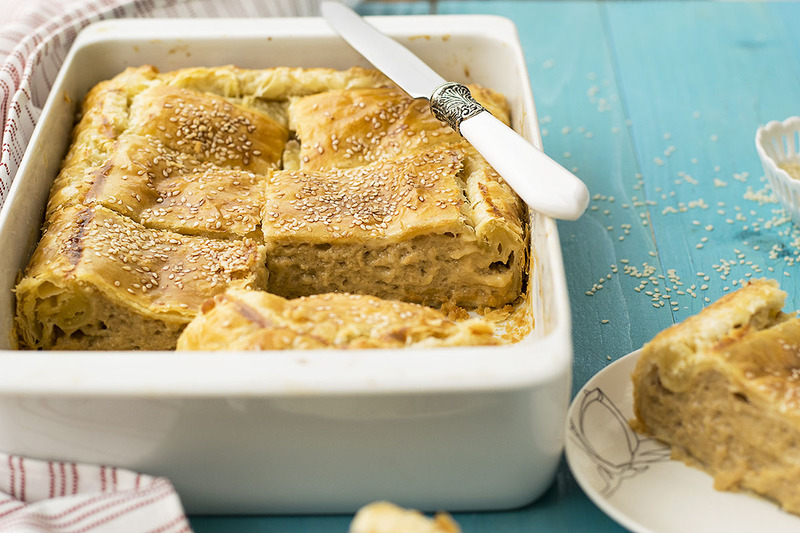 This savory cheese pie is made with puff pastry and filled with four different types of cheese and a black tea and cinnamon scented béchamel sauce. Make the scented milk for the bechamel: Heat the milk in a small pot until it almost starts to boil, remove from the heat and add the tea bags, the cinnamon sticks and the cloves. Let them steep for 3-5 minutes and discard the tea bags. Pass the milk through a sieve to catch the cinnamon sticks and the cloves. Make the béchamel sauce: Cook the flour with the oil in a large pot until it smells nutty and then remove from the heat. Add the warm milk gradually, whisking constantly to prevent it from forming any lumps. When all the milk is added, return to the stove and cook over medium heat, whisking constantly, until it thickens. Preheat your oven to 375°F (190°C) and lightly grease a 10x8 inch (27x20 cm) rectangular pan. You can also use a round pan 10 inches (26 cm) in diameter. Make the filling: Add all the cheese (except the feta) to the béchamel sauce. Add a generous pinch of salt, freshly grated pepper, the ground cinnamon and the ground nutmeg and stir to mix. Add the two eggs. Beat the third egg into a cup, add the half to the béchamel sauce and keep the other half for the egg wash.Mix well to combine. Wait for the filling to cool down and add the crumbled feta. Make the pie: Place the one sheet of puff pastry on the pan, making sure that it is large enough to overhang from the edges of the pan. Add the filling on top of the puff pastry and level it with a spatula. Top with the second sheet of puff pastry, fold the edges inwards and pinch them with your fingers to seal them. Beat the remaining egg with 2 tablespoons milk and brush the surface of the pie. Score the surface with a sharp knife and sprinkle some sesame seeds. Bake at the lower rack of your oven for 50 minutes (if you notice it starts to brown quickly cover with a piece of foil). Let it cool for at least 40 minutes before serving. This savory cheese pie is best eaten at room temperature or slightly warm. This savorie pie sounds incredible Mako.i am trying to imagine the taste but I. Going to have to try it to find out.? I love cheese pie! And I love anything made with feta :). This sounds incredible! This really looks so delicious,The black tea bechamel sauce sounds interesting.